Last week we listed Canada’s most popular names for 2007. 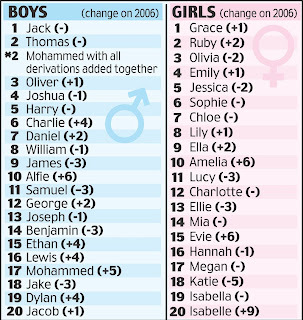 The Daily Mail has posted the UK’s most popular names for 07 (pictured right) and BBC has posted Scotland’s most popular names for 07 (pictured below). It is interesting to see that names that are very popular in one country don’t even make the list in another. Sophie(or Sophia) appears to be popular in all countries. It tops Canada’s list and Scotlands list, and gets to number 6 in the UK. In the UK, their multicultural community shows it’s strength by vaulting Mohammed into the second spot. It also appears a few times on the list with 7 different spellings.